Standardisation of scraper bridge design is key to Jacopa’s successful initiative to ensure that the company’s popular range of robust, reliable scraper bridges provides customers with the best possible value for money. The company’s experts have invested significant time and effort into ensuring that costings for all of the range of standardised options are in place, enabling quotes to be prepared in an extremely timely fashion. The costings, at metre increments, support a wide range of standardised equipment including four types of scum removal systems, sludge blanket detection and torque monitoring equipment, standstill detectors and electrical overload protection. Jacopa offers half, three quarter and full rotating bridge models of scraper bridge, which are designed to fit the various specifications of circular settlement tank that customers supply, including M&E requirements. Drawings are also in place to support proposals, and the company is working on producing 3D designs to support BIM requirements. The company also builds its scraper bridges offsite to avoid costly and complex delays and clashes, minimising activity on site. Factory build also ensures that each part is tightly monitored for quality, cost, and construction time, and thoroughly tested before delivery. Jacopa’s ‘design for manufacture and assembly’ (DFMA) approach, focusing on ease of manufacture and efficiency of assembly, is a key element of the company’s scraper bridge offering. Simplified product design ensures that solutions are available in the least possible time at the best possible cost. This approach ensures that Jacopa’s scraper bridges provide a cost-effective solution for removing sludge and scum from settlement tanks, and are designed to ensure on-going realisation of tank parameters, including loading conditions. 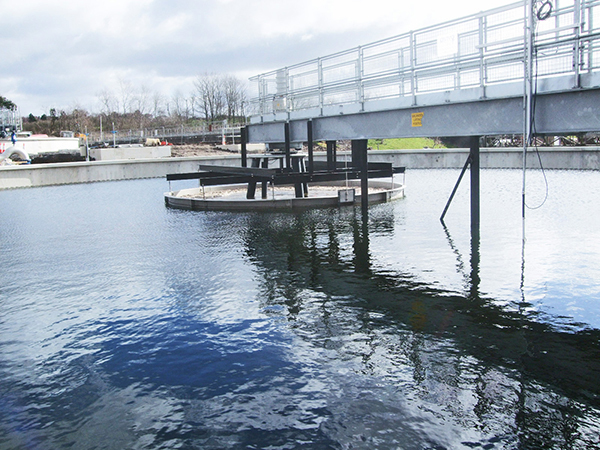 Recent installations include Gowerton, where two of Jacopa’s half-bridge scrapers were supplied at environmentally important Welsh Water, wastewater treatment works. The 77,000 PE Gowerton treatment works is in the picturesque North Gower area of south Wales, and discharges highly treated effluent into the Loughor estuary, which is a designated Special Protection Area, a Special Area of Conservation and a RAMSAR site. 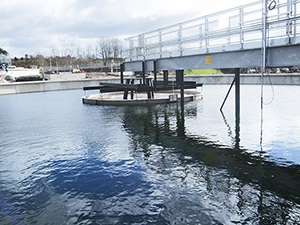 The 16.3m bridges were assembled in house – their size meant that access to the busy treatment works site and positioning had to be carefully planned and required excellent communications with the client. The timing of the installation was meticulously organised to precisely match relevant site activities and the client’s state of readiness.